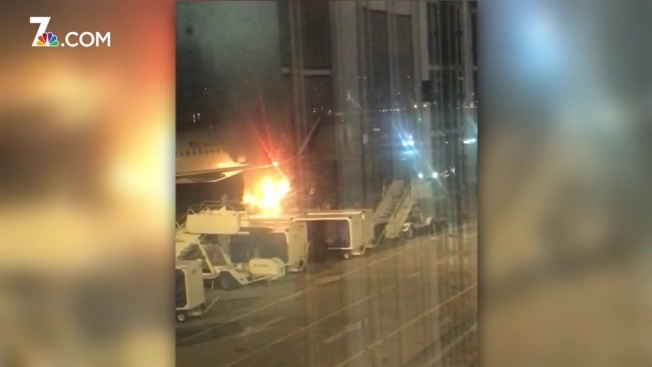 Video captured by an NBC 7 viewer showed a truck in flames next to a plane at San Diego International Airport (SAN) on Thursday. Matt Chase said he saw the lift truck catch fire underneath a Delta plane. Djournee Sonny also sent photos to NBC 7 showing the fire next to a plane with several crews on the ground. SAN fire crews confirmed that a truck caught fire underneath an airplane just after 11 p.m. Thursday. A spokesperson for Delta said the truck was a cabin service vehicle that was next to one of their planes, an Airbus A321. No one was aboard the plane at the time of the fire and no injuries were reported. "Delta commends the quick work of its employees as well as those from the San Diego Airport who worked to extinguish a fire on a cabin service vehicle," the spokesperson said. The plane was thoroughly evaluated by maintenance technicians before it was put back in service. The airbus' next flight was from SAN to Detroit, Michigan Friday morning, Delta said.